If you're a Crook County employer, you may have heard opportunity knocking recently. 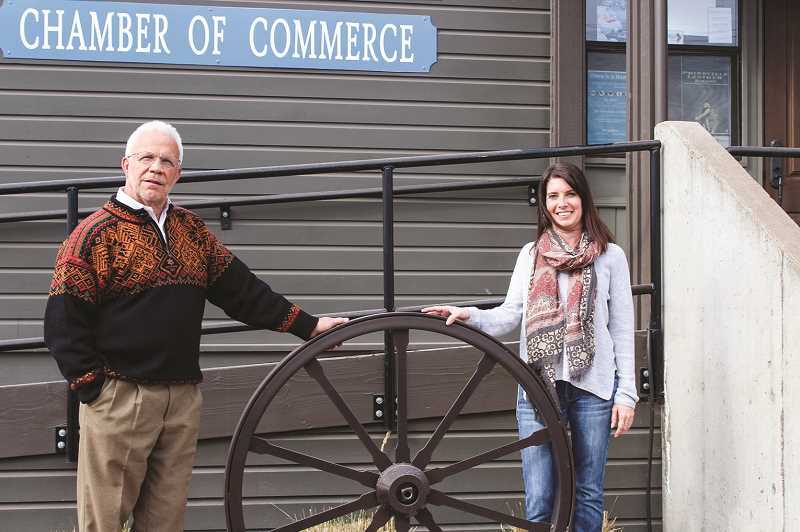 Larry Jones, the new internship coordinator with the Prineville-Crook County Chamber of Commerce, has been seeking out employers who he believes could benefit from having student interns. "The business side is where my forte will be, and I think Prineville is very ripe for it," Jones said of introducing young workers into the local workforce. "I will be a real salesmen for that and will be contacting businesses and brainstorming with them regarding internship scenarios." The idea of hiring a part-time internship coordinator came up a couple of years ago when Casey Kaiser was executive director of the local Chamber. Executive Director Katie Condit of Better Together approached Kaiser with the idea of introducing an internship program through Youth CareerConnect. Youth CareerConnect is an initiative of Better Together, working to advance the collective impact of educators, businesses, governments and youth development organizations. It strives to nurture a culture of internships, ensuring the quality and increasing the number of opportunities young people have to apply their academic experiences in workplace settings. Chambers and economic development agencies are involved in Youth CareerConnect in Bend, La Pine, Redmond, Madras and Sisters, and Condit believed it could be successful in Crook County. "Crook County has a position within the Crook County School District that does something like this, but the position was responsible for it all," pointed out local Chamber Executive Director Kim Daniels. "It was not only the point of outreach to the students, but was also supposed to be the outreach to the businesses, all while its primary focus needed to be within the school building." Kaiser said there were often challenges in matching the interest of education with the interest of the businesses. "The idea behind the program was if the Chamber would be interested in housing an internship coordinator, that role would primarily focus on the interest of the businesses," Kaiser said, adding that education services staff would facilitate the students. "We needed someone on the business side to be familiar with and represent their interests and then be the follow-up liaison with the businesses." The plan came to fruition in early January when Jones began his half-time position as the Chamber's internship coordinator. "My job as internship coordinator is to make it work and get intern applicants placed where appropriate into an internship with businesses," Jones said. If businesses or agencies have internship openings, they contact Jones and then fill out an internship request on the Youth CareerConnect website. Further discussions between Jones and the business will answer questions and further define the details of the position. Similarly, if local students ages 16 to 24 are interested in internships, they can fill out the student internship profile online. Crook County High School students should contact Joe Becker, the CCHS School-to-Work coordinator for assistance. Students and participants from Central Oregon Intergovernmental Council, Heart of Oregon, Central Oregon Community College, Oregon State University Cascades, or any other school or agency should contact Jones if interested in an internship. The Youth CareerConnect Central Oregon website will list the profiles of students seeking internships and regional organizations seeking interns. Jones will work with students and employers to facilitate a match, initiating and guiding the process. Funding for the internship coordinator position comes from the Crook County School District, a grant from East Cascade Works, and Better Together Central Oregon, which received a $10,000 Facebook Prineville Data Center Local Community Action Grant for the program. Key players include students, schools, colleges, training programs, businesses, the local Chamber, EDCO, and public and private employers. Daniels said the Chamber hired Jones for the position because they knew he would "take the bull by the horns." "We need someone that can come in and can be self-sustainable and make this program happen," Daniels said, noting Jones' past career experiences with youth, government agencies and businesses. Jones says the internship program is just beginning to hit the ground. He seeks businesses that may be interested in creating internship positions and encourages parents to help their students fill out an application/profile on the Youth CareerConnect.org website. If students are unsure of which career path to follow, Jones and the school coordinator can help. Jones says helping students decide on a potential career field is an important aspect of the internship program. "Internship by definition is introducing these kids to their first work experience on the ground: getting up, getting dressed and leaving their cellphone in the car, and going to work, and developing important soft skills," Jones said. Internships train youth in a work setting, providing real-life situations in a hands-on environment. They can also give students a chance to explore potential careers and develop professional and technical skills. If they meet the school requirements, students can earn academic credit for their internship participation. Employers benefit from interns, Jones said, by having access to a work-ready labor force and contributing to the local economy. Some interns work without pay while others receive wages. However, Jones noted that it is anticipated that oftentimes even unpaid internships may turn into paid employment. "We're about to see a change in what kids do after high school. College is often unaffordable or not appropriate for all students," Daniels said, noting that companies are starting to hire high school students and train them. "With this multi-faceted internship program, so many entities throughout the community are involved and important to its success," Daniels said. "Through the Chamber's internship coordinator, we now have a focal point for facilitating efforts which will connect students and employees. I visualize that the program will become an important element of Crook County's economic development efforts."